Canada is a cold place, so it only makes sense that their Olympians bundle up, even if it's for the closing ceremony. Team Canada's mittens at the Rio Olympics Closing Ceremony were just about the cutest looks, in my opinion, and highly patriotic! While each team has their own unique look, like Great Britain with their light up shoes, Canada's is just so Canada, I can't help but love the charm of it. Several Team Canada athletes are repping their home country and posting photos on Twitter wearing their super cute mittens. 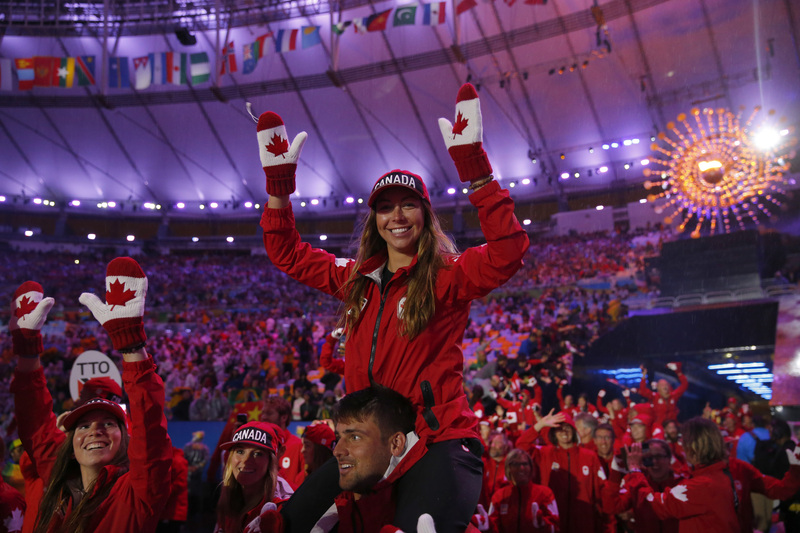 Wearing a jacket and hat emblazoned with "CANADA," swimmer Brittany MacLean posed holding up her hand in the red and white mittens with a red maple leaf in the middle. Gotta keep those hands toasty! The mittens, made by Hudson's Bay Red Mitten Initiative, are actually available online to purchase, so you can rep your favorite team quite easily. Since 2009, the Hudson's Bay Red Mitten Initiative has actually raised over $27 million to "help Canadian athletes succeed," according to Hudson's Bay's website. Cute mittens and an awesome cause? Sign me up for that! When you purchase a pair, you're actually making a difference. For each pair of $12 mittens sold, 30 percent of the sale is donated to the Canadian Olympic Foundation. Ok, so it may be like a thousand degrees at the moment, but I know these red mittens will come in handy when it's a frozen tundra in the East Coast. And you can purchase them, here. These look super durable and thick. They definitely won't fail you in the winter! And people are loving these mittens on Twitter. See what I mean about the charm? Canada, you've officially won my heart tonight. And my dollars, since I'll be purchasing these mittens online!